Each year, the College Board presents awards to citizens who have contributed in a variety of ways to foster the mission of the College. College Board Medallions of Recognition are presented to denote leadership, scholarship, and service. 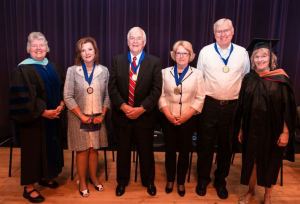 The Professor Emeriti awards honor Lord Fairfax Community College (LFCC) faculty members with exceptional service and contributions to the College. Honorees must be retired persons of faculty rank with more than 10 years of Virginia Community College System service. Award winners included: Hon. Kimberly Athey, Dr. Jennifer Gentry, Hon. Joe May, Pamela McInnis, Thomas Tredon, Lesley Casula, and Felicia Cogan (posthumous). The awards were presented at a special ceremony held prior to the LFCC Commencement exercises at Skyline High School on May16, 2015. We encourage you to congratulate these individuals when you see them in your communities. The Honorable Kimberly M. Athey is being recognized for her outstanding leadership in education and public service at the local and state levels. She has served as a member, chair, and vice chair of the Warren County School Board, representing the Fork District and Shenandoah County, since 2000. The capital improvement plans accomplished under her leadership are significant. Athey is a proud graduate of Warren County High School. She earned a bachelor’s degree from the University of Mary Washington and a juris doctor from the University of Richmond Law. Athey served as attorney and managing partner of Pond Athey Law, PC until 2014 and was recently appointed as Juvenile and Domestic Relations Judge 26th Judicial District by the legislature of Virginia in September 2014. Athey is a resident of Front Royal, Virginia and has served the community through many various leadership roles including member and treasurer of Warren County Bar, Inc., member of Rotary club of Front Royal, member of Front Royal Methodist Church Board of Trustees, and local Girl Scout troop leader. Athey, along with her father and siblings, established the Phyllis Madagan Athey Memorial Scholarship through the LFCC Foundation, which is awarded to a Warren County High School graduate entering LFCC as a full-time freshman. Athey is a longtime supporter of the local and state education systems. Dr. Jennifer Sager Gentry is a native of Stephens City, Virginia and began her career in higher education at Lord Fairfax Community College. She supported the College through various administrative and teaching roles, but her primary and most important role at LFCC was building a comprehensive institutional advancement program as the program director. Gentry served as campaign manager for LFCC’s first major gifts campaign – the “Building Community” Campaign – and secured $7 million for the College, including significant funds to support the Corron Community Development Center building project. In 2005, Gentry joined the VCCS as executive director of the Virginia Foundation for Community College Education and is the current vice chancellor for institutional advancement. She has worked with a statewide board of directors to generate awareness and resources on behalf of Virginia’s 23 community colleges. She has created a robust scholarship program and secured significant funds for the Great Expectations initiative serving Virginia’s foster youth. Gentry also led efforts to create the Commonwealth Legacy Scholarship Program and the Chancellor’s Award for Leadership in Philanthropy. Gentry received her doctorate from Nova Southeastern University, a master’s degree in business administration from James Madison University, and a bachelor’s degree from Bridgewater College. She is a 2006 graduate of Lead Virginia, and also serves as an adjunct faculty member with the University of Richmond’s Institute on Philanthropy. Gentry cares deeply about the mission of community colleges. She has achieved remarkable success and has used her talents to advance and support all 23 community colleges in Virginia. Honorable Joe T. May ran his first successful campaign for public office in 1993 joining the Virginia House of Delegates as the representative of the 33rd House District, which includes portions of Clarke, Frederick and Loudoun counties. Delegate May served in the state legislature until 2014. During his tenure, he served as chairman of the Transportation Committee (2008 – 2014). Delegate May was also instrumental in creating the Science and Technology Committee and served as its chairman (1998 – 2007). Delegate May was a senior member of the House Appropriations Higher Education Subcommittee (1998 – 2014). Virginia colleges and universities – including Lord Fairfax Community College – were very fortunate to have Delegate May as a strong ally in support of many key higher education initiatives. As a delegate, he was a strong STEM advocate and youth mentor, and continues to promote these areas in his business and personal life. In addition to May’s leadership in the Virginia House of Delegates, he is a pioneer in the fields of engineering and business. In 1977, he founded Electrical Instrumentation and Technology in Sterling, Virginia, which has grown to a $40 million a year company with more than 200 employees and additional facilities near Danville, Virginia. May is a sixth generation Virginian and a graduate of Virginia Tech where he earned a bachelor of science degree in electrical engineering. He currently resides in Leesburg, Virginia. Pamela M. McInnis is being acknowledged for her outstanding leadership in education and her significant efforts in partnership with Lord Fairfax Community College (LFCC). McInnis has served as superintendent of Warren County Public Schools (WCPS) since July of 2001. She first joined the division in 1991 and has served in a variety of administrative positions including director of elementary education and assistant superintendent for administration. Throughout her years of service, McInnis has demonstrated a commitment to providing quality educational programs for the students of Warren County. She has also been a strong supporter of LFCC encouraging partnerships in educational programming such as Dual Enrollment, Mountain Vista Governor’s School, and WCPS staff development through LFCC’s Workforce Solutions and Continuing Education training. In 2007, McInnis was named the Region IV Superintendent of the Year. She has served on the boards of the Virginia Association of School Superintendents and the Virginia School-University Partnership, as well as sitting on the State Superintendents Leadership Advisory Committee. She has served on the Board of Directors of the Blue Ridge Arts Council and the Samuels Public Library Board of Trustees, and currently serves on the Warren Memorial Hospital Board of Trustees. McInnis received a bachelor of science degree in elementary education from Longwood College (University) and earned a masters of education in school administration and supervision from the University of Virginia. She currently resides in Front Royal, Virginia. Professor Thomas Tredon, retired associate professor of mathematics, began his tenure with Lord Fairfax Community College on the day the doors at the Middletown campus opened in 1970. Throughout his 44 years of dedicated service to the College, higher education, and the study of mathematics, he maintained his energy and enthusiasm for teaching and was well respected by his students and colleagues. Professor Tredon’s students appreciated his dedication to their success at all levels – including modifying courses and adapting new instruction techniques and activities to enhance student outcomes. In addition to the high-quality instruction provided in the classroom, Professor Tredon was an active member of the Virginia Mathematics Association of Two-Year Colleges – serving one term as secretary (1989 – 1991) and one term as the north region vice president (1987 – 1989). He also served as the College’s contact for the Mathematics Association of America, and was a member of a statewide speakers’ bureau of college instructors as a specialist on the topic of the history and applications of complex numbers. Professor Tredon supported the community college system statewide presenting on various topics in the field of mathematics at peer group conferences. In 2000, he was recognized by his faculty peers and was the recipient of the LFCC Distinguished Faculty Award. Professor Tredon earned a bachelor of science in mathematics from the University of Wisconsin and received a master of science in mathematics from the University of Illinois. Professor Tredon exemplifies a love of learning, a dedication to the success and betterment of both students and fellow faculty, and a deep commitment to the mission of Lord Fairfax Community College. Lesley D. Casula, retired associate professor of business administration, began her tenure at Lord Fairfax Community College in August of 1990 teaching courses in business and marketing. In her 20 years of committed service to the College, Casula’s contributions are numerous – from the countless organizational committees on which she served, to her continuous dedication in finding opportunities for students to become involved in their community. Casula is responsible for developing the marketing and management programs at LFCC. She was instrumental in establishing the entrepreneurship career studies certificate at LFCC. She emphasized that many areas in the College’s service region are populated by small businesses and that successful entrepreneurs benefit their communities by stimulating the economy through job creation. The coursework provides students with the skills to start and develop a business, work with others to identify business opportunities, or join entrepreneurial ventures. The entrepreneurship certificate program promotes LFCC’s commitment to providing accessible, flexible, high-quality and cost-effective educational programs that prepare students for further education, job advancement, meaningful careers and lifelong learning. Casula serviced students at both the Fauquier and Middletown campuses teaching through distance education, and was a grant recipient to develop a web-based course for marketing. She was consistently evaluating the marketing and management curriculum for its relevancy to the needs of both the business community and students. She also served her colleagues at the Fauquier campus well in her role as chair of the Fauquier Faculty Council for over five years; her voice was always one of reason and cooperation attested to by her unanimous vote each year to continue in this role. Casula also provided consulting services to the Small Business Administration Center of LFCC, and conducted seminars for numerous organizations in the Shenandoah Valley. In 2010, Casula was honored with the Annual Excellence in Teaching and Leadership Award at the National Institute for Staff and Organizational Development Conference. Casula is an individual who makes a difference in peoples’ lives – among her students, her colleagues, and her community. Casula retired in August of 2011. Cogan devoted 26 years of student-oriented service to the College teaching a variety of courses in the areas of English and journalism. She supported her journalism students in establishing a College newspaper that was enjoyed by all. Aside from her role as a gifted instructor in the classroom, Cogan served as the liberal arts program lead as well as director of the College’s honor program in its formulating years. Through these roles, Cogan helped to create the standards of excellence and expectations of integrity that LFCC continues to value today. Cogan earned her undergraduate degree from The University of Tulsa, and her graduate degree from Trinity University. She earned acknowledgement in Marquis’ Who’s Who Among Teachers, and was the recipient of a Master Teacher Medal from the National Community College Leadership Program in 1997. Cogan’s contributions to LFCC were further recognized when she was awarded the College Board Medallion of Recognition – also in 1997. Cogan truly believed in the community college mission and she demonstrated that by endowing a scholarship for promising first-year student writers, a scholarship that continues to be awarded each spring. While Cogan passed in 2000, her legacy lives on through her numerous and lasting contributions. Many fellow faculty remarked that it was an honor to know and work with her.